the Viking Encampment at L'Anse aux Meadows NHSC - Daily Life in the Viking Age circa 1000 AD at Vinland. L'Anse aux Meadows National Historic Site of Canada. An overview of how the original interpretive program at L'Anse aux Meadows physically presented. Describes the work stations and the characterizations used. 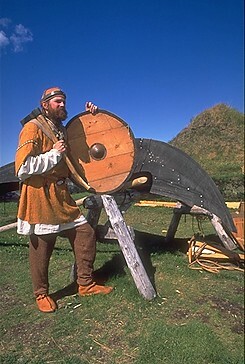 For 10 days in August of 1996, a small team of four interpreters mounted a prototype presentation of living history for the Viking Age at L'Anse aux Meadows NHSC. This is a short overview of that initial presentation. From it's original inception in fall of 1992, the Norse Encampment was intended to be a professional level program. For this reason, a defining 'Mission Statement' was one of the first tasks undertaken. As the program has developed, this Mission Statement has helped to keep the processes and objectives of the program clear. This academic paper was written in early 1998 about various aspects of the Interpretive program developed for L' Anse aux Meadows NHS. The version available here was given at the 27th Annual Association for Living Historical Farms & Agricultural Museums (ALHFAM) Conference at University of Waterloo. This version deals with more of the practical aspects of the creation and operation of the Viking Encampment program. This is a copy of the original press release used to promote the 1996 presentation. Parks Canada and the Viking Trail Tourism Association co-sponsored this two week long demonstration. This served as a test of the feasibility of developing a full time living history program for the L' Anse aux Meadows site. Although originally prepared in 2000, this guide for travelers to Newfoundland in general, and L'Anse aux Meadows NHSC in particular, still provides some valuable information.
" The weather a thousand years ago was warmer and the supply of resources seemingly endless. Why then did the Norse abandon North America? " 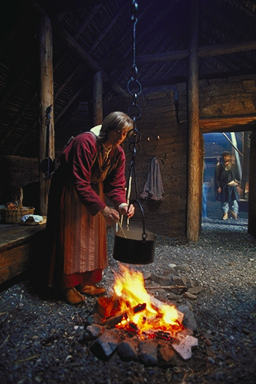 In 1996, a small team of four interpreters mounted a prototype presentation of living history for the Viking Age at L'Anse aux Meadows NHSC. 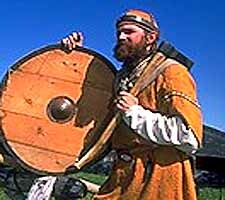 Over 10 days in late August, the group carried out daily activities typical of life in Vinland circa 1000 AD. The response of the public was so good that Parks Canada, then in partnership with the Viking Trail Tourism Association, commissioned the creation of a regular seasonal program. This presentation started in June of 1997. The overall program design was undertaken with consultation with Parks Canada and other experts in Viking Age history, most notably Dr Birgitta Wallace. In dependant Interpretive Program Designer Darrell Markewitz designed, created and implemented the final package. Activities centre in the reproduction turf buildings on the site and within the fenced compound surrounding them. This enables a clear separation from the archaeological site itself. The program is staffed by costumed historic interpreters, supported by a collection of replica Norse artifacts. These staff members recreate the Viking Age, providing not only commentary on the period, but also portraying characters from the past. They are also involved in activities typical of the times, providing physical demonstrations of life styles and technologies. The Encampment area is open daily within the normal operating hours of the site. The conduct of this presentation is somewhat distinct from the present guide program at the museum but is fully integrated with ongoing activities. Note: The information presented here represents the original program as it was conceived and implemented in June of 1997. As with any good museum program, ongoing changes have been made since then to respond to changing information and situations. The following information represents my own views and as such should be considered 'unofficial documentation'. It does not in any way represent the 'official' position of either Parks Canada, L'Anse aux Meadows NHSC, or their staff. Specifically, this presentation represents aspects of daily life as it would have been carried out at the Vinland outpost and also is expanded to provide insights into the larger framework in Norse culture in general. Several hundred individual replica artifacts have been introduced to the site: cooking gear, tools, navigation equipment and household goods like beds and chests. Small scale physical demonstrations of domestic and craft skills are undertaken throughout the day. Crew - This work station is set close to the entry gate and the reproduction faering already on site. The interpreter here is equipped with a selection of period tools and navigation instruments. In addition there are a selection of personal goods in wood storage chests, and a collection of simple cooking irons about a fire pit. Special attention is given to explaining ship construction and demonstration of Norse navigational aids in this area. Turf 1 - This station is set in the main room of the large turf building. 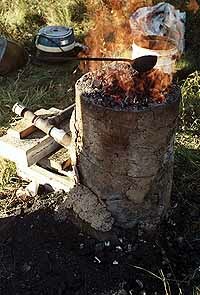 Here is found a cooking fire, with a collection of fire irons and pots. As well there is a collection of small household objects, (lamps, bowls, etc.). The demonstrations in this area focus on period domestic technologies, primarily open hearth cooking, which consists of the cooking of small flat breads (handed out to the public for 'tastes') as well as complete meals. Textile demonstrations include dyeing wool and spinning using a drop spindle. The role of women in Norse society is stressed here. Turf 2 - This station is located in the second large room of the main building. The area contains a selection of personal effects including sea chest and sheep skin sleeping bag. A static collection of Norse blacksmithing tools can also be seen here. The main topic in this area is the production of iron at LAM and the role of the craftsman, with demonstrations centred on antler and soapstone carving. Turf 3 - This last station is set in the room at the north end of the longhouse. The artifacts here centre around a collapsible bed, and similar upper class personal goods. There is also a selection of trade goods and raw materials in this area. The emphasis here is on Norse social structure, with teaching of the game 'hneftafl' providing the main physical demonstration. Over the years since the program was installed, staff has understandably changed. Each continues to portray a distinctive individual and has their own specialized skills, so on any given day you may meet a new combination of characters and see different activities underway. As the historical role of 'Leif's Houses' in Vinland has become better understood, the mix and type of characters has been modified to reflect current research.